Looking for a fun way to beat the summer heat? With just four ingredients (and no sugar added) this summer popsicle makes a perfect healthy treat! Hmm…I get the feeling they’ve been up to something! I went in to make my bed and they immediately stopped what they were doing and just stared at me. Don’t you think that seems pretty suspicious? The girls were so excited to get their new pets and we’ve all fallen in love with them! They both have very distinct personalities too. 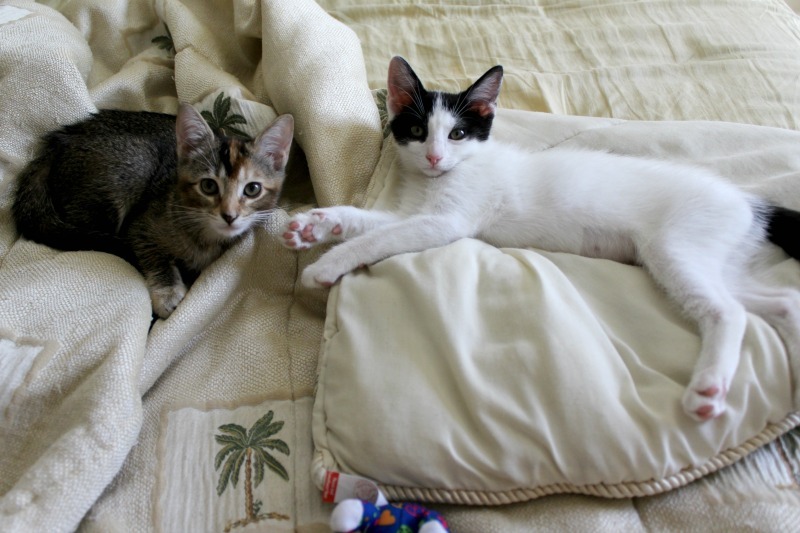 Amilia, while playful, is definitely the calmer kitten of the two. She’s playful but a lot more mellow than Sugar. Sugar is the cat that climbs all the way to the top of the curtains and thinks that everything in the house is her own personal cat toy! I still think they’re up to something though. 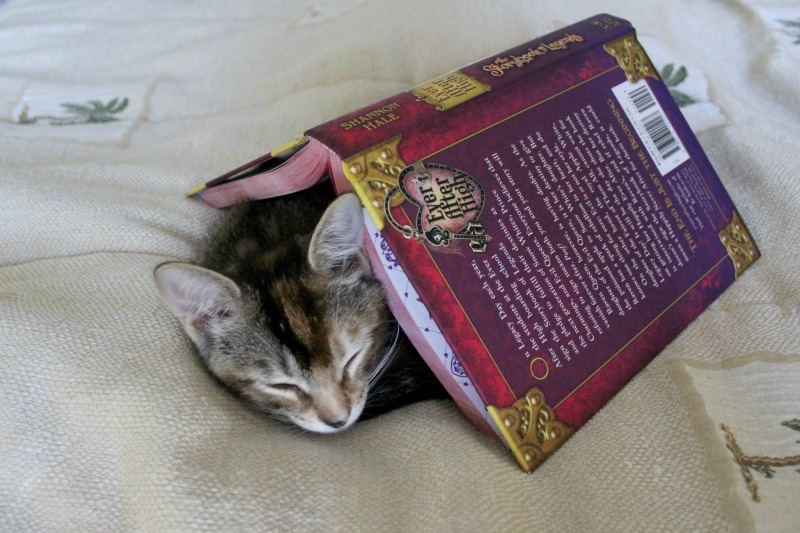 I walked in on Amelia reading a book and she suddenly pretended to be asleep! 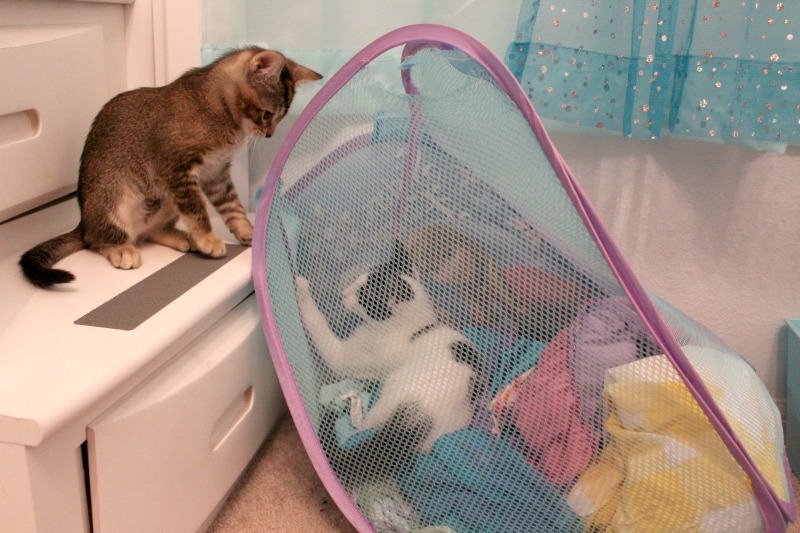 Later I caught them doing laundry, though when I walked in they just acted like they’d been playing. Hey, if they feel like doing laundry, I’m all for it! …because a few minutes later I caught her trying to order movie tickets on my phone! I’m starting to think that our cats may have a secret life that they’re trying to hide from us! Maybe that’s why we’re all so excited to see the new movie The Secret Life Of Pets. It’s about what pets REALLY do when they’re owners aren’t around! Since I’m always looking to save money (popcorn gets expensive), I was pretty happy to find out that Mott’s is offering free movie tickets and vouchers when you purchase their products. This was a no-brainer since we already buy their products on a regular basis! Mott’s has teamed up with Fandango to give you a free child’s movie ticket* to The Secret Life Of Pets when you buy any 3 Mott’s Juices or Applesauce (*$9 child admission, restrictions apply). Hmm…an excuse to go shopping at Target? I’m in!!! Don’t forget to save your receipt so you can get your free movie ticket! All you have to do is follow the easy directions on the Mott’s product packaging. Even though the movie ticket is a nice bonus, the real treat is that I’m teaching my girls to make nutritious choices on their own. I feel really good about giving them Mott’s Apple Juice and Mott’s Applesauce, and my four year old is always proud of herself when she makes her own healthy decisions. 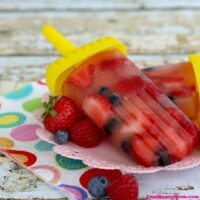 Sometimes we make it even more fun by coming up with new recipes like these Summer Berry Popsicles! They make the perfect summer popsicle because they’re so cool and refreshing! My girls love helping out in the kitchen and this is a delicious treat that we can all make together! They don’t even realize it’s good for them…they just think they’re eating ordinary popsicles! Since we usually drink the Mott’s 100% Apple Juice 64oz, I thought I’d change it up and use the Mott’s for Tots Apple White Grape Juice 64oz. You could also add Mott’s for Tots Fruit Punch, Mixed Berry, Grape or regular Apple. 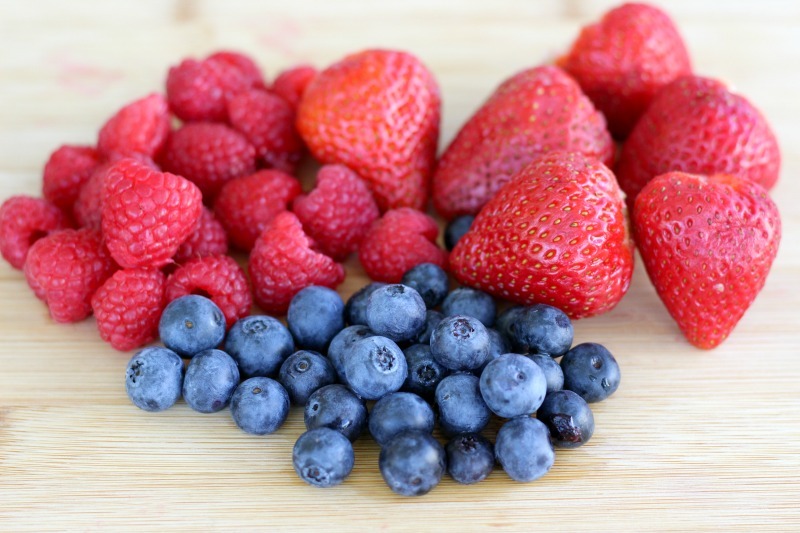 I love that I can get everything I need right at Target and so I picked up some fresh strawberries, raspberries and blueberries while I was there. Cut your raspberries in half and the strawberries into chunks, then fill the popsicle containers (my girls loved helping with this part). Fill the containers just short of the top with juice (you don’t want them to overflow when you put the stick in). I used Mott’s for Tots Apple White Grape Juice but you can switch it up with Mott’s for Tots Fruit Punch, Mixed Berry, Grape or regular Apple Juice varieties. How easy was that?! 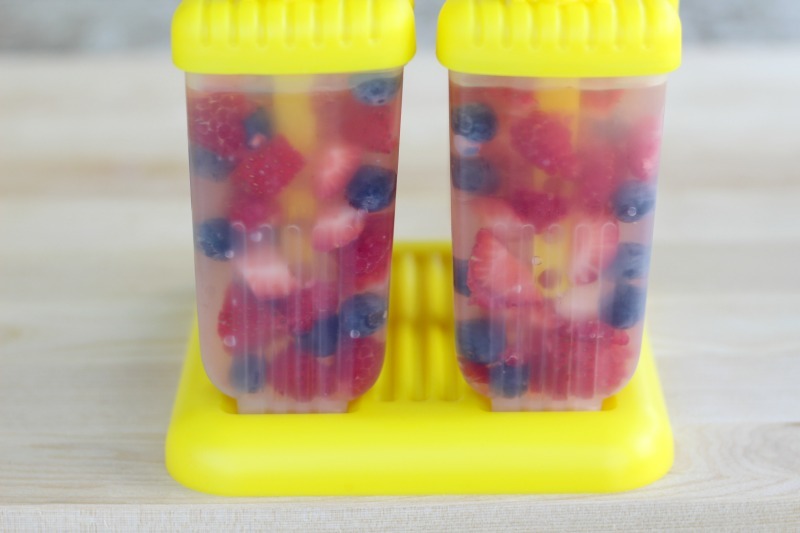 Now all you have to do is freeze them overnight and you have a fun, delicious treat for the kids. Well, maybe not just for the kids because I think they’re pretty awesome too! 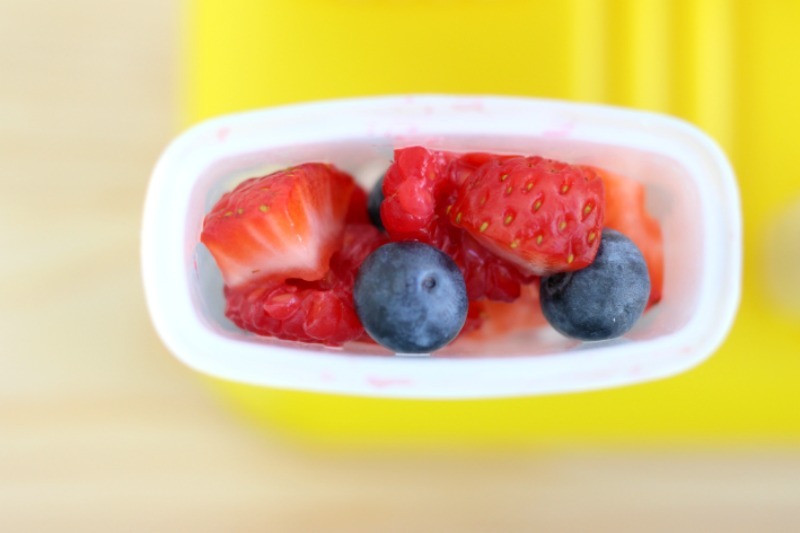 Want a delicious dessert that's both refreshing and healthy? You'll love these easy to make Summer Berry Popsicles! Find out more about special offers and recipe ideas here! 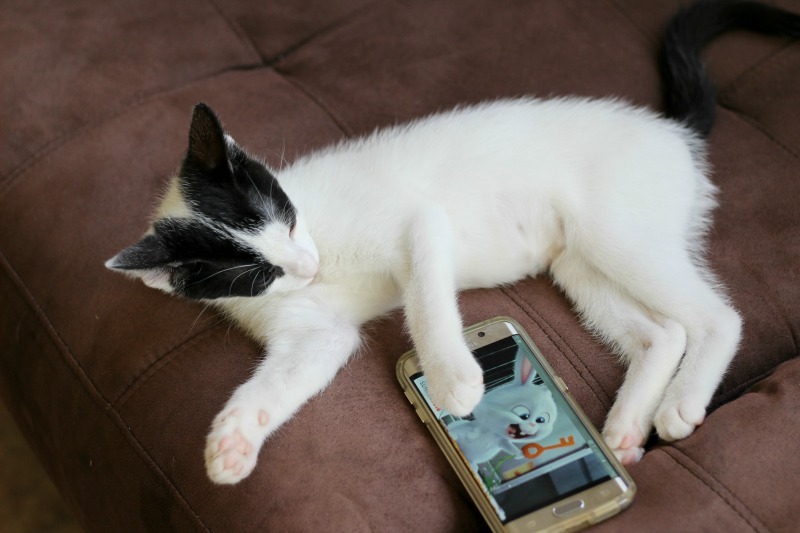 What do you think your pets get up to when you’re not around? This is a great idea! I’ve never thought to use grape juice in a popsicle. I can’t wait to try it! The boys saw The Secret Life of Pets a couple weekends ago and loved it! They were so good! I’m going to use grape juice more often. Great idea! Can’t wait to try it! Thanks! I think you’ll really love it! 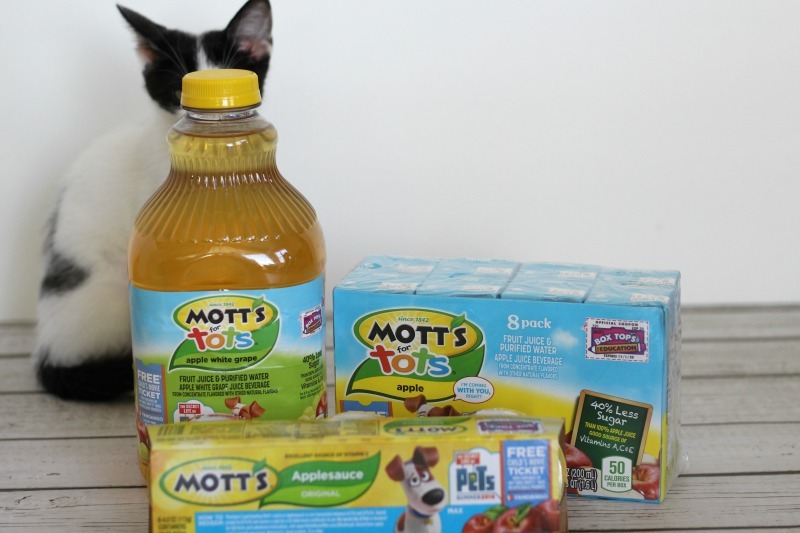 I really love all Mott’s products, especially my all-time favorite apple juice. So, just looking at this delicious popsicile . . . I’m sold! Joyful Savings recently posted: A Little Secrect To Make Your Boxed Cake Taste Like Homemade! If you like Mott’s, you’ll really love these! The great part is that you can make so many different popsicles with it! 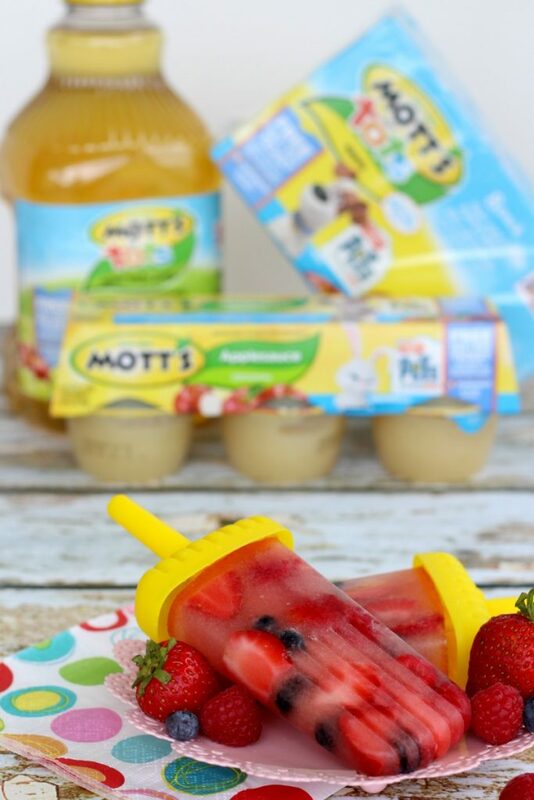 They will love it and the best part is that you can change it up with different flavors and different Mott’s juices! This is a great idea! I’ll need to Make it for my kids this summer!